The Dutch Safety Board is shocked by the air disaster in Ukraine and thoughts are with the next of kin of those on board. The Board will be doing all it can to provide next of kin with as much information as possible about the disaster. Therefore the Board will be travelling to Ukraine at the earliest opportunity to take part in the international investigation into the disaster, which occurred in the Donetsk region. The Dutch Safety Board was formally informed on the air disaster by its Ukrainian counterpart (NBAAI) at around 8am this morning. The NBAAI also requested the Dutch Safety Board to participate in the international investigation. According to international (ICAO) regulations, the State in which the crash took place is responsible for taking the lead in investigating the circumstances of the incident. In response to Ukraine’s request, the Dutch Safety Board will be sending a team of investigators to take part in the international investigation. Contact will also be sought with the relevant authorities for retrieving the data stored on the ‘black boxes’. The Dutch Safety Board would like to stress the importance of carrying out a full and thorough investigation into the disaster. Given the large number of Dutch fatalities, the Board will contribute in any way it can to the investigation into the cause of the crash. What is the Dutch Safety Board investigating? 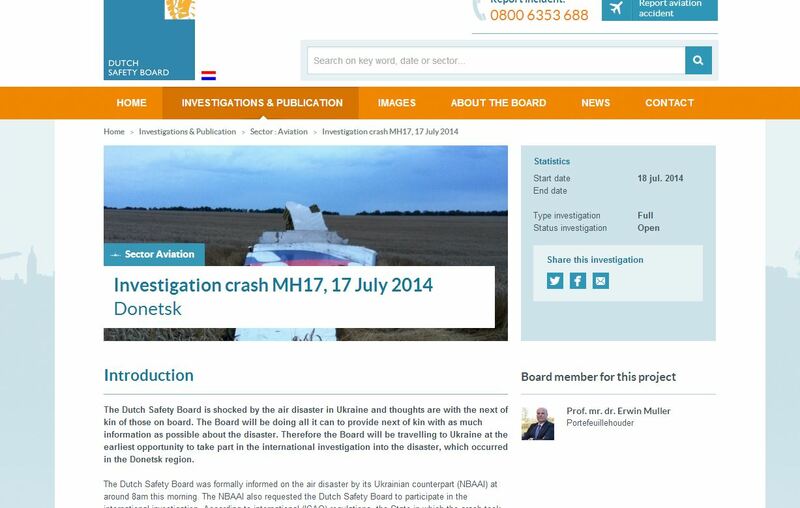 The Dutch Safety Board is conducting three investigations as a result of the crash of flight MH17. The first investigation will focus on establishing the cause of the plane crash. This is an international investigation, involving several countries, and will be conducted in accordance with the rules of ICAO. The Dutch Safety Board will take the lead in this investigation. Facts that are obtained as a result of the investigation will be used to establish the cause of the crash and rule out other possible causes. The aim of the international investigation is to provide next of kin and the (international) community with information regarding the cause of the crash. For this reason, the investigation must be conducted carefully, using all of the available information to uncover the exact cause and, in turn, rule out any other possible causes. The investigation must ensure that the conclusion regarding the cause of the crash is undisputed and thus generally accepted. The Board would also like to prevent next of kin being confronted, in the future, with new speculation that could cause uncertainty regarding the circumstances of the disaster.